The five chair clinic was set up in the newly constructed monastery clinic and our “expediter” was WangchukRapten, a medically trained monk in charge of the clinic. Each day brought a new group of patients –we treated young monks and two schools of children who had to walk 1 1/2 hours each way to get the first dental care of their lives. Volunteers were touched by these kids – about half had good teeth and the other half were living in chronic pain from untreated dental problems. Days were filled with cultural interactions as volunteers taught these children the rudiments of oral health – diet and tooth brushing instruction and discussed individual treatment options. This trip, volunteers stayed at a lovely guesthouse, equipped with hot water and intermittent wifi. Meals were eaten with the 300 resident monks, accompanied by beautiful chanting before each meal. Rural clinics can be full of unexpected challenges. Volunteers worked unpredictable hours as patients arrived from long distances and compressors struggled with fluctuating current loads. 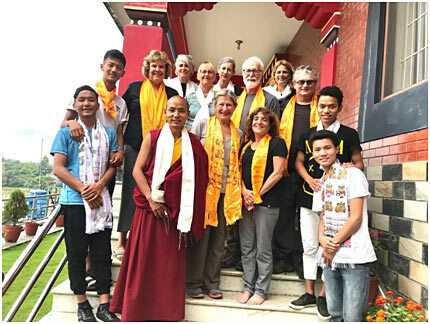 The trip was chock full of new cultural experiences as well – a haunting circumambulation by 300 monks in full ceremonial robes, time for a beer at the local canteen, made up songs and games with the in demand “toothbrush dinosaur,” torrential monsoon rains and tiny glimpses of the massive Himalayas in the distance. Small Adventure clinics allow GDR to reach new populations of children and volunteers to stretch their travel skills with deep immersion into local cultures. Together, the Namobuddha team formed deep bonds as they marveled at this magic time together. GDR has two trips planned to Namo Buddha in 2019. Join us at this very special location if you can! It means a great deal to us to be able to expand our care to more kids in 2019.